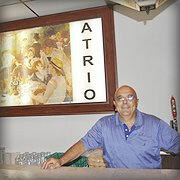 The Luigi Fata family would like to welcome you to Atrio Banquets and Catering. Formerly of Brother’s 2 Restaurant, our family was approached by many of our past customers to re-open a banquet facility to provide banquet and catering services to their families, companies and organizations. 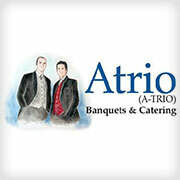 In 2010, the trio of Louie, Travis and Nicholas formed Atrio (a-trio) Banquets in a freshly remodeled and spacious facility. We are conveniently located at 409 Hooper Road in Endwell, New York just minutes from the Route 17 (Interstate 86) and Interstate 81 junction in Binghamton. Our handicap accessible facility with ample parking, provides us with the capability to easily configure our furnishings to accommodate groups of all sizes. The acoustics are great for live bands and our spacious dance floor will accommodate even the most active party guests. We offer a varied menu with many choices and are proud to use local and fresh ingredients whenever possible. Cocktails, appetizers, buffets and banquets… the possibilities are endless! Combine our menu with our open bar, beer, wine & soda and cash bar options and you have the start of a memorable event. Silverware, china & stemware are all included standard. Linens are also available in a variety of colors to put the finishing touches on your party or event. We are known our great food and exceptional service. Our family would be proud to serve your family and we look forward to meeting you and your banquet or party needs. Call us today at (607) 444-3576 to learn how we can put our over 40 years of restaurant experience to work for you!